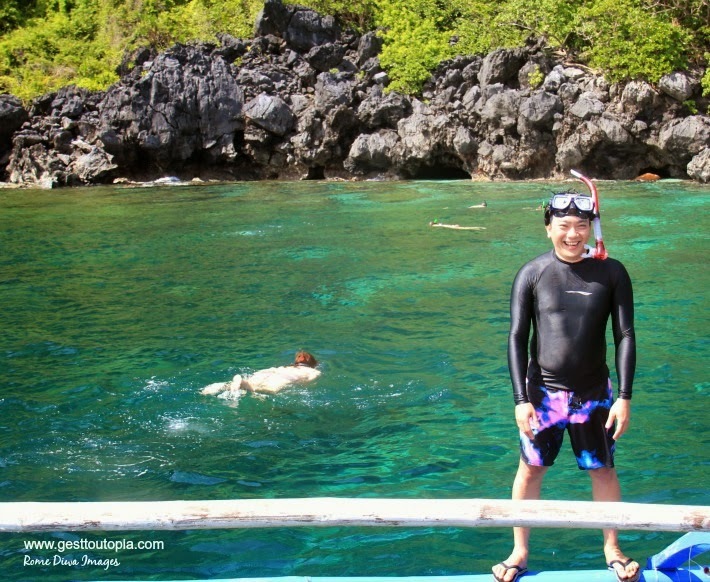 Additional part of Tour A package of our El Nido island hopping were light water activities such as fish-feeding and snorkeling. 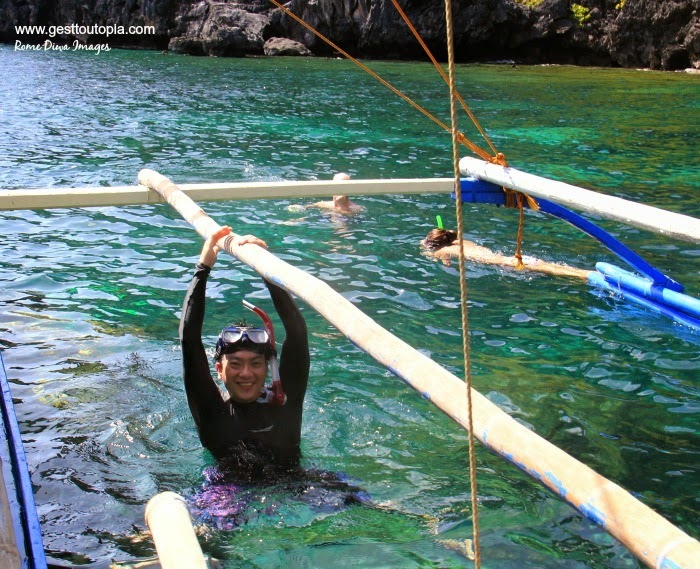 These fun activities happened right after our challenging exit through El Nido's famous Big Lagoon. While waiting for the Secret Lagoon, our supposedly next destination, to be free from overwhelming crowd, the captain of the boat headed to a reef nearby. Location and time for such activities depends on your boat captain and crew, usually varies with tide and the time-table of entering the lagoons. There are also many factors to consider like the course of wind, and boat condition. Of course, strong current means swimming is definitely not advisable. Unless you rented an inclusive boat, you may opt to negotiate to your tour operator to drop-by at the nearest uninhabited beach that you fancy and may spend your extra time swimming. 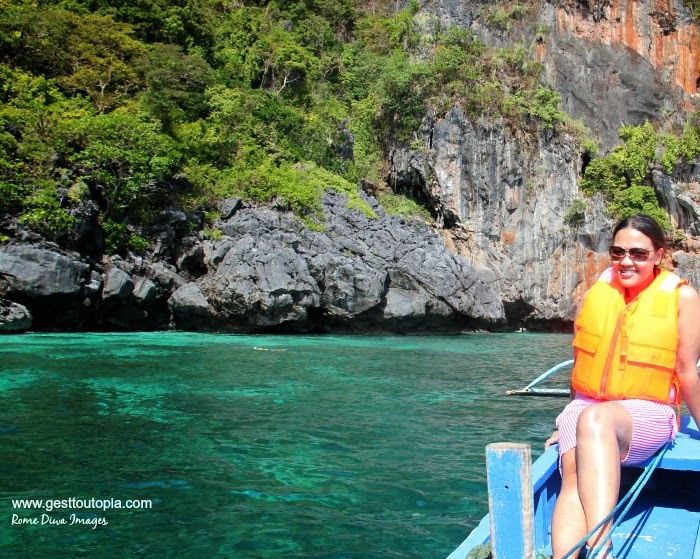 The world's most beautiful beaches are in El Nido and you have a lot to choose from. That's what we did when I travelled back early this year joining my cousin's company outing but that's a different story. Oftentimes, tour operators exclude these cool activities particularly when you are running out of time to go back in mainland. Strong winds and currents normally occur during afternoon, I was told by one of the boatmen and they have to hurry to go back to the port strictly following Philippine Navy's protocol. Trixie and I joined the group composed of different nationalities - there are Dutch, Portuguese, Koreans and locals. Its the most quiet group I've joined-in among my travels or maybe I'm not aware and was just distracted by the natural beauty that sorrounds me. Speaking in fluent English, our travel guide told us stories, stated facts and figures about El Nido, and cracked some jokes which I'm sure he already told millionth times but delivered each punchline like its new. Haha. The jokes are spoil-free with me so I'm not telling any. Anyway, he was able to build authority along the way and expertly explained the activity's do's and dont's eventually. I admired how he was able to control such a large group of different people, probably around thirty. Unlike any other group I joined in from my previous travels, this group listened attentively and abided by the rules strictly, he deserved an applause in handling such a wide range of people. A clear win for me should there been an Oscars for tour guides. It was in the middle of the day and was really hot when our boat stopped at the reef in the waters of Miniloc Island not far from Big Lagoon's entrance surrounded by turquoise water. No beach chairs, crowd, sunshades nor souvenir vendors ...it’s a jewel. 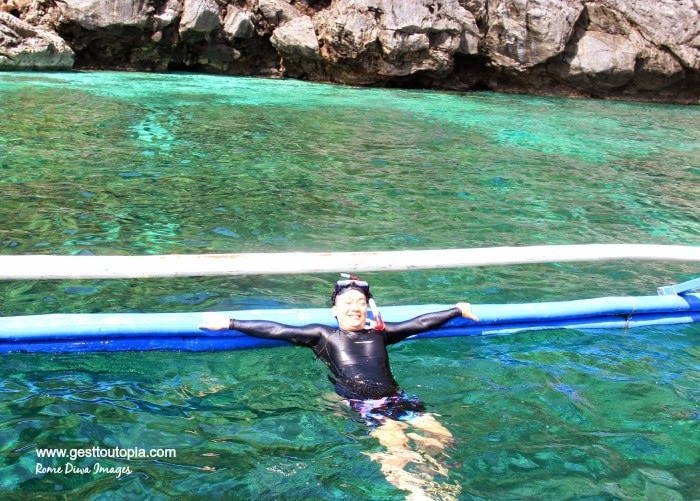 Jaw-dropping Miniloc Island renowned for its beauty worldwide served as our magnificent backdrop while snorkeling, floating, and fish-feeding for almost an hour. It was a marvelous site of unspoilt beauty to behold for a moment. The world's best island and my beloved country's last frontier, have majestic cliffs with lush greenery sit above the turquoise water. 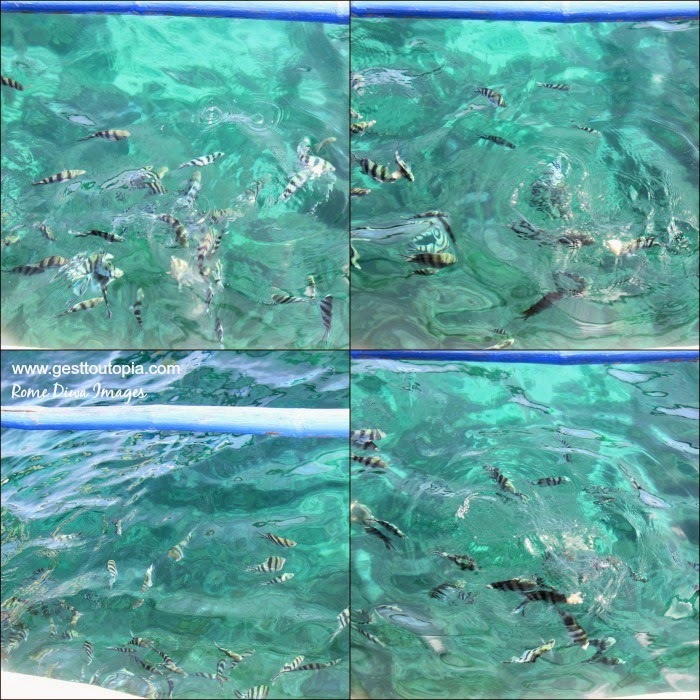 I swam off Miniloc waters and found school of fish lurking around me. Being away from the sea for quite a long time made me a little bit scared starring at sea creature's eyes so I hurriedly float onto the surface only to find out that Trixie, laughing tremendously on the boat, throwing bread crumbs near me, ugh! I went back into the sea and seen school of fish and two harmless small sharks travelling in tandem, destruct the fish in their paths as they swam among the stunning natural habitat of the reefs. 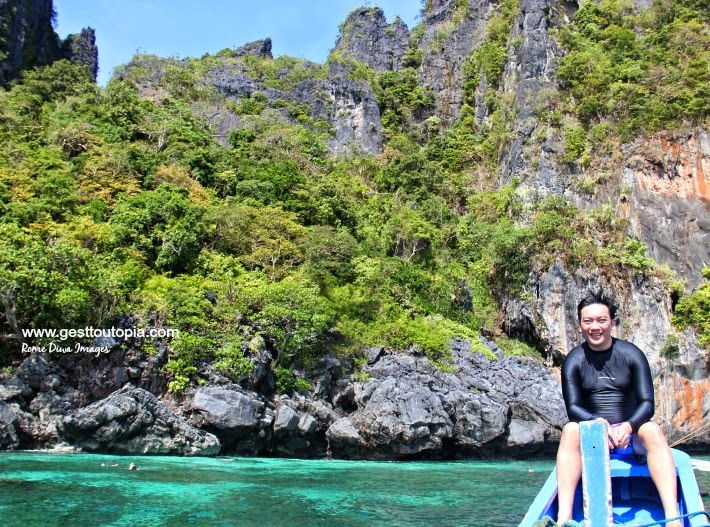 It was such a beautiful experience again and again seeing the underwater world and just admired the life and colorful coral gardens of El Nido. 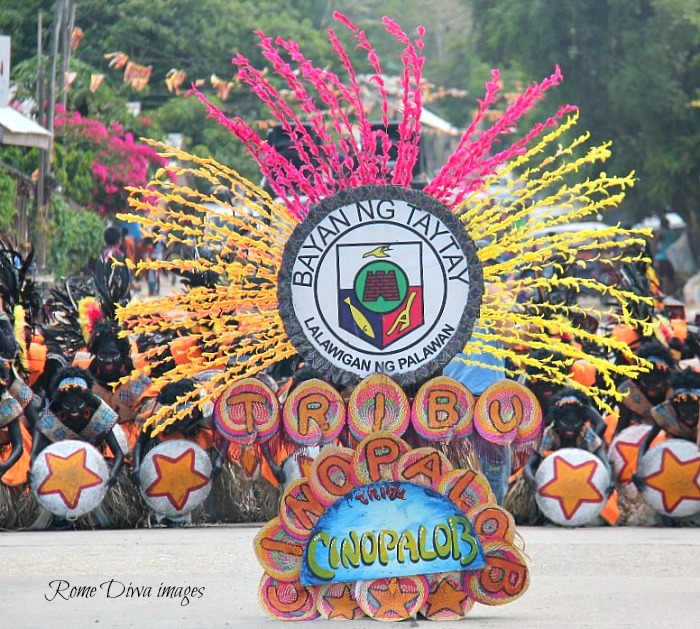 Photos are all mine and were meant to be posted to my defunct travel blog hence the watermark.